Publisher: Ruth Nyaboe January 03, 2019 This information is provided solely as a guideline. Today I bring you a recipe that most people do not like to make. Chapati. Most people think that making Chapati is so hard and would instead cook something simple, but I am here to tell you that making Chapati is as easy as anything else. Before we begin, Chapati is also known as Roti, Shabaati, Safati or Roshi in the Maldives. It is as unleavened Kenyan flatbread filled with flaky soft layers and pan-fried until golden. Perfect for pairing with tea for a light breakfast or alongside stews. See below my very detailed steps to making the perfect and softest layered Chapati. ➤ In a bowl, mix together flour, salt, and margarine. ➤ Add water and knead the dough. Knead for 10-15 minutes or until the dough is super soft. Cover with a damp cloth and rest for 30 minutes. ➤ Take a portion of dough in your palms (enough to fill your fist). Roll it out into a thin circle. ➤ Spread 1 tbsp margarine evenly and sprinkle some flour over it. This is how you would start to make the chapati's no matter which of the four methods you use. ➤ Now create the folds or rolls. View the video above for detailed information on how to roll it and create the layers. 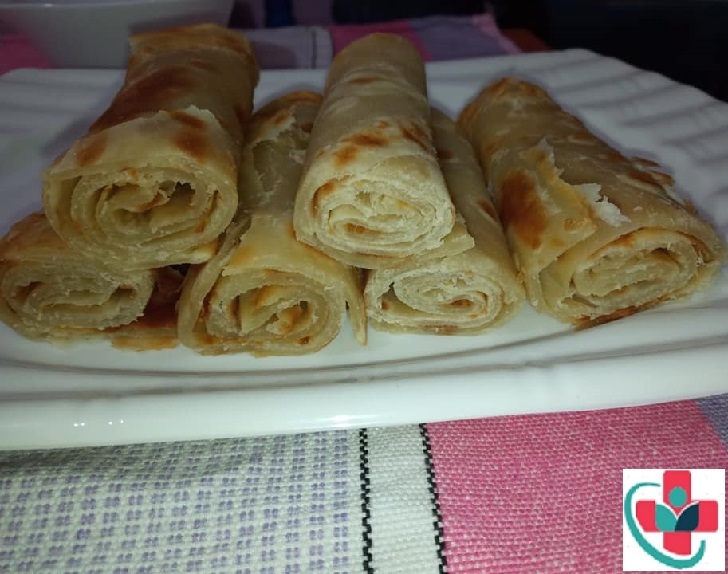 ➤ Once you have chosen your method of rolling the chapati into layers, press down the dough and roll the dough into a circle of your desired thickness. However, too thick will make the chapati too doughy and too thin will make it too crispy and it won't be soft. ➤ Heat a heavy pan (heavy pans make better chapati's than the light pans) and place the chapati on it. Cook for 30-45 seconds and once the air pockets start to form, flip it. ➤ Use a chapati press or fold cloth and press on the chapati on all sides so it cooks evenly. Flip it again, add 1 tsp of margarine on it and flip it over the margarine. (view the video above if this is confusing). ➤ Use a spoon or spatula to press the sides down as you keep moving the chapati. Cook for 15-20 seconds and flip it around again. Press down for another 15-20 seconds and its ready to serve. ➤ Serve straight away or if you are serving it much later, cover with a towel and set aside. This will keep them from drying out and will stay soft. You can also roll the chapati's and serve. I enjoyed these thin and flaky chapatis for breakfast with Chai ya Tangawizi (Kenyan Ginger Tea). They can also be served with stews and other meals like Sukuma Wiki. In Uganda, roll up with a vegetable to make a Rolex.